and even what's in the middle should appear – which is the camera." Film reviewing is like cross-country navigation: both activities demand an inherent understanding of the visual; to decode and interpret, and then relay this information to someone else to further their own knowledge. In map reading, that interpretation means you get from point A to point B. In film reviewing, it means you guide someone, in a similar fashion, from the start to the end. During the process, the business of travelling, the expectations we had might shift completely. We can turn off in a different direction; get ourselves lost and double back more times than we'll ever admit aloud. Once home, and we share our experiences with the rest of the world, we're changed. For good or ill, our horizons expand: socially, ideologically and personally, whether sat in the passenger seat and reading the map, or in a darkened cinema and travelling to another place without taking a single step. The cinematic 'country' represented by Miguel Gomes' Oscar-nominated Aquele Querido Mês de Agosto/Our Beloved Month of August (also known by the title This Dear Month of August), is quirky and endearing, full of provincial warmth, akin to Berri's Jean de Florette. However, there's no scheming to be seen from these citizens. Gomes' film is populated by those who still believe in community, and are unashamedly proud of where they come from. Even to jaded eyes, those well-trained and well-travelled, its 144 minutes are a breath of fresh air. August is only Gomes' second feature-length film, following the success of his debut, A Cara que Mereces/The Face You Deserve and six shorts (one of which, Cântico des Criaturas /Canticle of All Creatures, is included in the extra features on the disc). Even so, his global reputation is impressive, building steadily year-on-year through festival screenings and awards recognition, which in itself has resulting in several retrospectives of his work, including the Viennale in 2008. Set in the rural mountain region of Arganil, Portugal, the first hour of the film unfolds as a picturesque travelogue, full of provincial charm, showcasing exactly why it's known as the country's heart. Buzzing with activity in the height of summer, we see everything from festivals and dancing, to the local newspaper going to press, and the fire engine weaving through the roads. Then, echoing the bipartite structure of The Face You Deserve, gone is the documentary mode, and the film shifts gears, imperceptibly, into a fictitious narrative about a young singer and her struggle against her domineering father, as she criss-crosses the region, singing with her band. The story rises up from the places and faces we've come to know, as naturally as the sun rises every morning. Watching the change occur is like watching an elaborate magic trick, one that's made all the more special by the fact that we see every stage of the process. Gomes and his film crew aren't just behind the camera, they're in front of it too; threads in its rich tapestry. After a while, it becomes hard to tell what is fact, fiction, or even if it matters, because the blending of the two worlds is so completely seamless. Oil and water, can mix. This isn't a film which merely suggests the idea that documentary and fiction modes can coexist, it proves they can blend and make a new whole. Genre, has to my mind, always been an evolutionary process. Though there are obvious common elements, there's always been room for flux. August plays with, and celebrates that flux. Of course, it's not a new idea, every film whether its subject is documentary or fiction is a construction, pieced together to make a single unit. This film is just one of a number in recent years, including Barnard's The Arbor, Costa's No Quarto da Vanda /In Vanda's Room, Apichatpong's Dokfa nai meuman /Mysterious Object at Noon, and Jie Zhange's 24 City that test the boundaries of genre, breaking beyond its limits, which leave us searching for new labels with which to classify them. Cinema that incorporates metatextual or self-reflexive material are often deemed cold and distanciating, but August is far from that. Rather than being one of those overly clever, showy films that have come to define the very term, there's a relative sense of truth to what we see on screen, but more importantly, there's a passion and real warmth too. Gomes and his team clearly enjoyed their time in Arganil, and that certainly comes across, without feeling remotely false. Likewise, the humour that arises from the process of making the film: going through the tome of a script to find a story, setting up shots and recording sound, feel genuine too. All too easily, films like this fall into the trap of pretentiousness, but thankfully, August is not one of them. Clearly not a man to take himself too seriously, Gomes onscreen is depicted as disinterested and noncommittal, the very antithesis of his off-screen self, and the traditional cinematic representation of the obsessed, egomaniac director. The inner workings of this man's extraordinary machine are on show for all to see. You could argue that in genre blending like this, August rather muddies the waters of cinematic purity, but to say such a thing is doing the film and Gomes both a disservice. In the frames of this film, there's passion for cinema as an art form and as entertainment. The love and respect Gomes pays to the people of Arganil is evidently clear throughout, but it's important to note, in these throwaway times, where things deemed fresh, new and innovative are prized, that Gomes treats film itself with the same care and reverence. There are markers of filmgoing life well lead. Should you look closely, you'll find echoes of his fellow countrymen Pedro Costa, Paulo Rocha, João César Monteiro and Manoel de Oliveira. Elsewhere, you'll be reminded of Gilliam's Lost in La Mancha, Altman's Nashville, and Jonze's Adaptation. In it's look and feel, there are touches of Rivette and Fellini (Amarcord is August's most obvious cinematic relation, along with Fleming's The Wizard of Oz), and in the film's comedic, farcical leanings, the work of Emir Kusturica. Given how disparate and seemingly conflicting that list of references sounds, you'd be forgiven for thinking the result on screen is messy and lacks cohesion, but it couldn't be further from the truth. The real power of August comes not in how Arganil is represented in terms of aesthetics – and it does look beautiful, you could take almost any frame and snap it for a postcard – but in terms of emotion and human experience. Strip away all the concerns about what the film is in terms of style and genre, shut down the debates about what may or may not be real, and what you're left with is a group of people, living their lives, enjoying the opportunities afforded to them while they can. Though there are many lessons to be learned from this film, tucked away amidst the humour and the playfulness, as the credits rolled, I was left with one lasting thought: no matter how far we travel, there really is no place like home. Another hugely impressive, director-approved, transfer from Second Run, one with a splendidly crisp picture (particularly for a DVD) and spot-on contrast that achieves solid black levels without decimating the shadow detail. The colours are reasonably naturalistic and on occasion really pop, notably the red of the roosters that bookend the film. Film grain in visible but has thankfully not been emphasised through enhancement (there are no traces of that here), and while some dust spots are evident on uncluttered backgrounds, they are rare and never distracting. The framing is 1.66:1 and anamorphically enhanced. A very fine job. The restored Dolby 2.0 stereo soundtrack does have a slightly narrower dynamic range than expected for a three-year-old film, but the dialogue and the music are both very clear, with only a slight treble bias to some of the singing. The electric guitar in the Estralas do Alva Band number on Mount Culcurinho has a particularly full and rich sound. On the side of supplemental features, there's a great little package here, and I'd argue that the presence of Canticle of all Creatures alone is enough to make a purchase. In addition, there's the added caveat that this release marks the first time the film has been available in the English-speaking world. The multi award-winning short begins in modern-day Assisi, circa 2006. A man (Paolo Manera) travels through the town, guitar in hand, offering up his own version of St Francis' hymn, 'Song of Brother Sun' (also known as 'Song of the Creatures'). For the first few moments at least, the film looks like it'll play out as a cross between a travelogue, an homage, and a music video for the hottest alternative band du jour. It's all of these things and none of these things at once. If you've never seen Gomes' work before, the tonal and stylistic shift that happens between the realist, handheld style of the short sequence in Assisi and what follows it will come as something of a shock. A clever and intriguing shock, but a shock nonetheless. In the blink of an eye, we're transported back to 1212, and find ourselves in the Umbrian woodlands, encountering St. Francis himself (João Nicolau). Except, the well-versed historians amongst you won't find this portrayal too familiar. At his side, is a young woman called Clare (Mariana Ricardo), something of a personal and spiritual guide, who helps him cope as he struggles with forgetfulness. Annoyed by the change in their Saint, the woodland animals who revere him become jealous and compete for his attention, singing a song in his honour. Yes, it's completely bizarre and crammed full with elements that clash, but it's clearly purposeful and it definitely works. 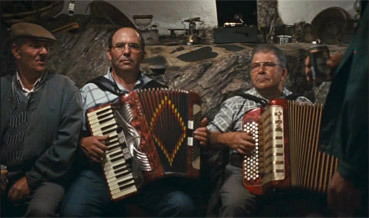 It revels in that strangeness, and celebrates its artifice just as loudly, when the lingering camera draws attention to the painted Umbrian backdrops; or when stock footage of wolves against a moonlight sky is voiced by children, howling away with their best impersonations, replacing the usual ambient sound. Fresh, vibrant and witty, it errs toward the anarchistic, and is great fun to watch. It accomplishes more in its short runtime than some directors hope to achieve in their lifetime. Fearless and creative, it's most definitely a blueprint for Gomes' work, but it also raises some interesting questions about the accuracy of historical account and the romanticised treatment of both historical and religious figures. Perhaps most importantly of all, it sheds light on what can be achieved if you leave the cinematic rulebook at home and let your imagination run riot. A great little sell that plays up the comedic elements of the film, with a nice balance of music and dialogue. It's guaranteed to make you smile, and want to see what becomes of the beleaguered film crew. This 16-page illustrated booklet, is, as ever, a great compliment to the film. The majority of its page are dedicated to an essay on Our Beloved Month of August, written by deputy editor of Sight and Sound, Kieron Corless, where he shares his experiences of the Indie Lisboa Film Festival, discovering a love for Portuguese cinema, and the work of Miguel Gomes; an appreciation which has clearly deepened over time. A wonderful read that's written with obvious passion and warmth, the piece is a reflection of Gomes' work on a both a personal and professional scale, with Corless taking time to contextualise Gomes' place within Portuguese cinema and global film culture. Closer to a lengthy chat with a knowledgeable friend than a dry, academic textbook, you'll learn a great deal without actually feeling like you're being taught something. Along with production credits for the film, you'll also find a short but illuminating director's statement. For those unaware of his past as a film critic, it's a very brief window into his writing style. The man is much like the work he puts on screen: witty, charismatic and jovial. His analogy about the bridge between factual and fictional cinema is one of the most accurate and useful descriptions I've ever read, arguably ripe for adoption by every film critic the world over when scrabbling for the words to describe complex, hybrid cinema such as Gomes'. 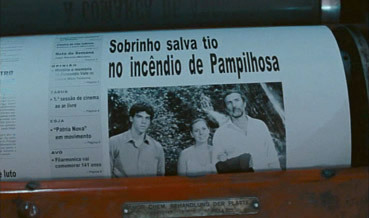 Our Beloved Month of August is both a love letter to rural Portugal and to cinema itself. This freewheeling, seamless hybrid of fact, fiction and everything in between, is also a celebration: of home, of nation and pride in both. Miguel Gomes is feted as one of Portuguese cinema's brightest and most talented artists, and this film showcases precisely why. A joy to watch. * For the rest of Mark Peranson's interview with Gomes click here.